Whether you're looking to make a career out of flipping homes or see it as a part-time venture, you can make fast money legitimately. Before you get started, you need to know the right way to flip, regardless of local market conditions and current economic trends. There's more to flipping than redoing a kitchen or staging a property. Every deal is different, and each investor must have a clear business strategy. Expert investors William Bronchick and Robert Dahlstrom have learned how to be successful in all types of markets--and now they share their secrets with you. From the bestselling authors of Flipping Properties, which brought the term "flipping" to American households, The Business of Flipping Homes is an A-to-Z guide for both new and seasoned investors. 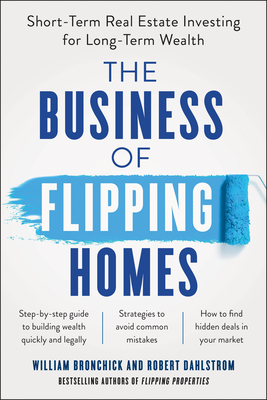 The book explains what flipping is and isn't, goes beyond the investment of a basic single-family home, and demonstrates how to find, renovate, and sell properties using proven methods. With more than 40 years combined experience in buying and selling investment properties, Bronchick and Dahlstrom explain how to avoid many of the pitfalls and issues that could drain your funds and come back to haunt you. They give systematic approaches on long-term planning, including how to find and work with partners, structure a business, and utilize your specific talents, resources, and aspirations in realistic ways. You'll learn how to figure out timelines, work with real-estate agents, understand the paperwork, analyze the numbers, utilize technology, and, most important, find the money. William Bronchick is a nationally known attorney, author and public speaker. He has trained people all over the country to become financially successful. He has shared the stage with names such as Rudy Giuliani, Steve Forbes, and Colin Powell. He has appeared on CNN, CSPAN and CNBC, and has been quoted by publications such as Time, Forbes, USA Today, and The Wall Street Journal. He is the co-founder of the Colorado Association of Real Estate Investors and the Executive Director of the College of American Real Estate Investors. Bronchick is a member of the Colorado and American Bar Associations. Robert Dahlstrom is a well-known investor, entrepreneur and real estate broker. He holds an MBA and a BS in accounting. He has helped many small businesses as a marketing consultant and spent five years as the CFO of one of the nation's largest lead generation companies. He has been interviewed by national radio and print media and is a popular speaker/educator. He was a founding board member of the Colorado Association of Real Estate Investors and leader of its Northwest group. He has been personally involved in hundreds of transactions and worked with a group that has purchased over 4,000 foreclosures. Having built houses and duplexes from the ground up, Dahlstrom is an expert in finding and assessing potential purchases, estimating expenses and managing the rehab process through the sale.